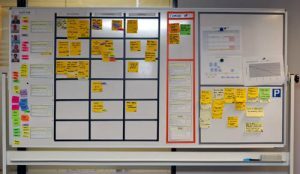 The most visible component of the scrum process is the “scrum board”, which is a type of visual management. 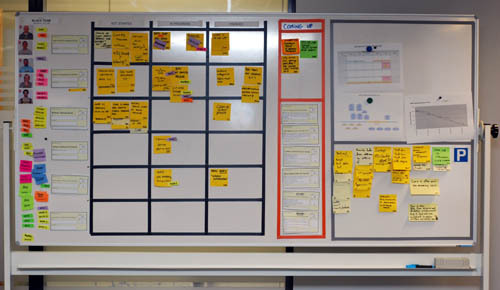 In short, it’s a visual “to do” list, showing what all members of a team are working on, and putting the team priorities and productivity up in a very visible place. In my own team, some of the basic tenets make sense and others do not. Harder to deliver increments: our product is often a number (benefit-cost ratio, ridership estimate, etc.) rather than a software program. If I interpret agile philosophy for this product type, it would mean: deliver a rough number quickly, and then see if the customer really needs a more refined, carefully estimated number. This values speed over perfection, and loops the customer in early to let them react to a partially complete product. However, this rarely works for us in practice. Many of our clients are unable to work with this; they don’t really understand that there is not “one single answer” but that the answer is really either a “rough estimate” and a “more careful estimate”. In particular, many cannot tolerate a number that changes; they will cling to the initial rough estimate. Mix of in-house staff and consultants: we often work closely with consultants. We could work in an “agile” manner with them, making them effectively part of the in-house team; but at present, we usually given them individual larger tasks (~1-2 months of effort) and let them work independently from the main team. This violates some agile principles (“collaboration, not negotiation”) but meets our primary need of expanded capacity without more management overhead.